Central Park West Dentistry is always looking for compassionate, like-minded people to join our team. We would love to get to know you during our special recruitment night! A little bit about us: We are real caring, for our patients and our fellow team members. We go above and beyond, and are accountable when mistakes are made. We love to celebrate victories big and small, and give back to our community. We are in a constant state of progress and are excited to watch each other and the practice grow. We’re currently recruiting for: Dental Assistant, Dental Hygienist, and Dental Administrator positions. Learn more: On our careers page, here. Come meet us: We’re opening our doors on March 9th, 2018 from 6pm-8pm. Members of each of our team will be here to learn a little more about you, and to let you know what it’s like to be part of the CPW Dentistry Team. Light snacks and beverages will be provided. 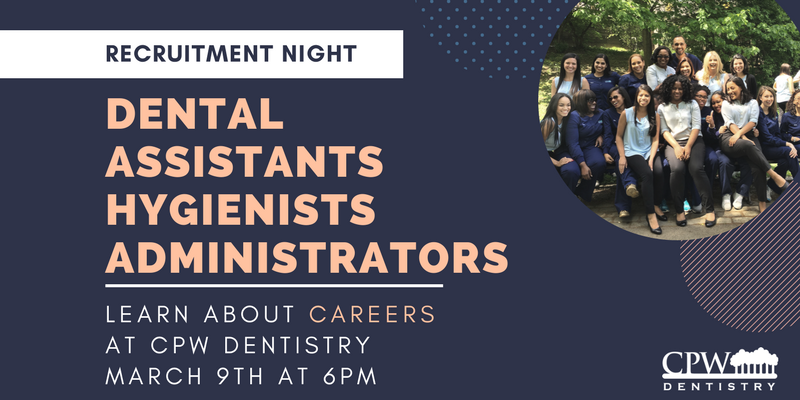 Please RSVP on our Eventbrite page by March 5th 2018, and email your resume to careers@cpwdentistry.com. Can’t wait? You can read some interviews with us on our blog: Malorie, Dr. Piamonte, Lauren, Luis, Tatiana, Shameka, Anel, Cailin, Victoria, Lana, and Erick.